Objective: The aim of the present study was to examine the effect of a polyherbal formulation (PHF) on pharmacokinetics and pharmacodynamics of metformin in rats. 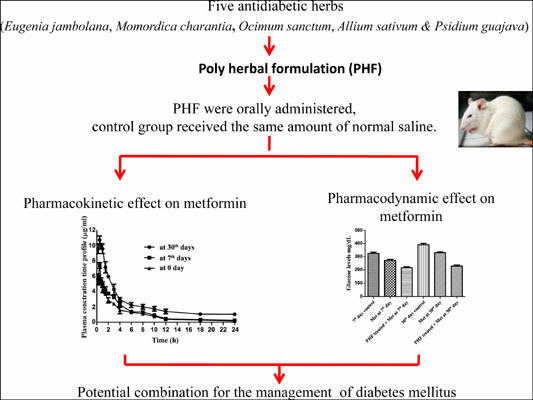 Methods: The present study was conducted to determine the beneficial outcomes of PHF along with metformin by studying herb-drug interactions. PHF was prepared by five indigenous herbs, Those are being used traditionally as antidiabetic in India. PHF doses (100 mg/kg/day) were administered to Sprague-Dawley rats by an oral route of different groups for multiple weeks except for control. Metformin (100 mg/kg) was orally administered at 7th and 30th day to control and PHF pretreated rats for pharmacokinetics study while pharmacodynamics study was conducted in PHF treated and untreated diabetic rats. No more significant difference was found in the pharmacokinetic parameters in PHF treated at 7th day while a significant increase was found in AUC at the 30th day. Results: The hypoglycemic effect was observed with a combination of metformin and PHF, significantly more compared to control. Metformin decreased the blood glucose 1.51 fold at 7th day and 1.7 fold at 30th day respectively, compared to control. Conclusion: Thus, this finding indicates that PHF increased the AUC of metformin. It might increase bioavailability through drug-herb interaction thereby affecting the therapeutic effect. This formulation can be considered as an adjunct to metformin in the management of diabetes mellitus. Metformin, pharmacokinetics, pharmacodynamic, PHF, diabetes, hypoglycemic.